My name is Lydia and I placed my perfect little girl for adoption 2 days after she was born. The raw and painful memories of that day are still so very real for me. But, the absolute joy I got from looking at the faces of her parents radiating with pure love and adoration for that perfect baby girl was all I needed to reassure me that I was doing the absolute best and right thing for her. She had a family. One that had been waiting for her for far too long. Catholic Charities is teaming up with the American Lung Association to offer proven-effective tobacco cessation classes to help pregnant women who smoke, quit for good. The agency is offering the 6-week class in Great Bend on Wednesday mornings at 10 am from Oct 5 to Nov 9th; in Garden City on Thursday mornings at 10 am from Oct 13 to Nov 17th; and in Dodge City on Mondays at 10 am from October 5th to Nov 14th, excluding Halloween. For more information about these classes, or to sign up, call 620-227-1562. The Lung Association’s quit smoking program has helped over one million smokers quit and it includes content on building a quit plan, medications that can aid quitting smoking, lifestyle changes that support quitting smoking, how to manage stress and how to overcome relapse and become smoke free for good. Smoking while pregnant poses risks to both mother and child, according to the Centers for Disease Control and Prevention (CDC), including low birth weight, damage to the placenta, pre-term deliveries and heightened risk of sudden infant death syndrome (SIDS). In fact, Kansas has one of the highest low birth weight rates in the nation at 30 percent. And according to state data, more than 6,200 women in Kansas smoked cigarettes during their pregnancies, and about one in every eight births involved mothers who smoked for at least three months shortly before or during their pregnancies. While smoking during pregnancy is dangerous, continuing to smoke after the baby is born is also dangerous for the child. According to the CDC, babies who breathe secondhand smoke are more likely to die from SIDS, have weaker lungs than other babies and are more likely to have infections and breathing problems. 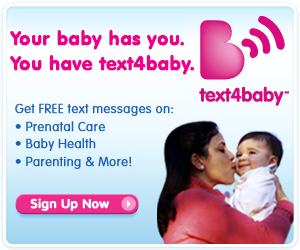 Click here to learn more about our free pregnancy counseling services. If you believe that you would benefit from any of these things, please contact Amy Falcon at 620-227-1590. Bringing your newborn home from the hospital is an exciting time, but it can also be scary! Your baby depends on your completely to meet all his physical needs, and you will probably have a lot of questions and concerns about exactly how to recognize and ultimately meet those needs, now, and in the future. New parents have so many questions and concerns about what's best for their baby's health and may worry that their baby isn't developing at a "normal" rate, or, don't know when they should start their baby on solid foods, or how to determine if their baby is sick or not. Because all children are different there are no hard and fast rules about any of these issues, but there are some general guidelines to follow. Here are a few tips to remind you how to help assure that you baby grows up healthy and strong. It is important to visit a doctor's office or a clinic throughout your pregnancy for pre-natal exams. A health professional will ask about your family's medical history, test for diseases, check your weight and blood pressure, and make sure that your pregnancy is progressing normally. Your family doctor or local family clinic can provide information for you about maintaining a healthy diet and exercise routine, and what to expect during your pregnancy. The best way to ensure that you give birth to a healthy baby is to live a healthy life-style during your pregnancy. It's important to get plenty of rest and exercise and eat a well-balanced, nutritious diet. As soon as your suspect you may be pregnant, you should visit a health professional---either an obstetrician, a family practitioner, a nurse practitioner, or a nurse-midwife. Years of research have shown that women who receive regular pre-natal care have healthier babies, and easier pregnancies and deliveries. Eating well during pregnancy is especially important, since you are "eating for two." This doesn't mean, however, that a pregnant woman should eat twice as much. You really only need about 300 extra calories a day during pregnancy, and they should be nutritious ones. Pregnant women need to eat well-balanced diets complete with proteins, fruits, vegetables, and whole grain foods. Certain nutrients are particularly important during pregnancy. Calcium keeps the mother's bones strong. Iron helps the mother's blood carry oxygen to the developing fetus. Folic acid is especially important, as it significantly reduces the risk of neural tube birth defects, or defects of the brain and spinal cord. Even though these nutrients are found in natural food sources, most women should take pre-natal vitamin supplements just to be sure that their diets are complete. When a pregnant woman drinks alcohol, it travels quickly through her bloodstream to her baby. Mothers who drink excessively during pregnancy are more likely to have babies with mental retardation and facial abnormalities (Fetal Alcohol Syndrome), impaired growth, and learning disabilities. 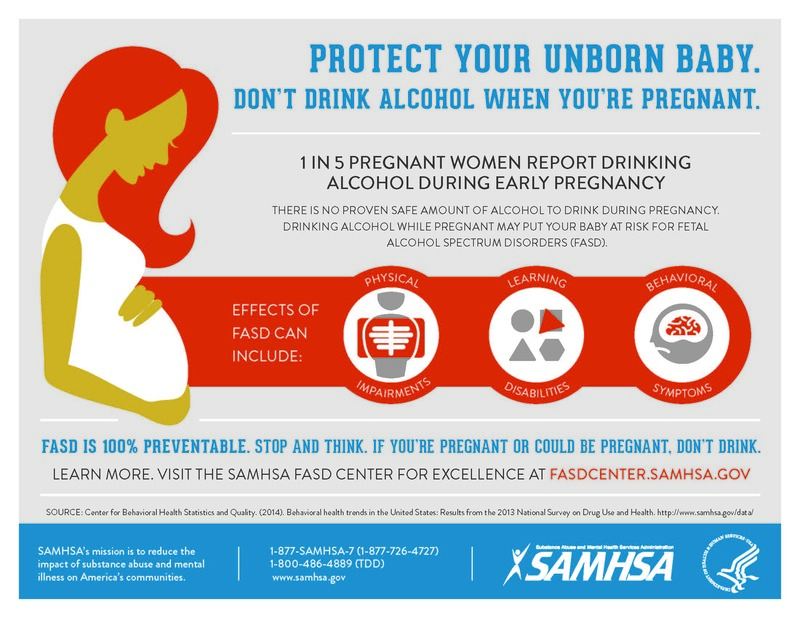 No one really knows how much alcohol is safe for a pregnant woman. The U.S. Surgeon General recommends that women do not drink any alcohol during their pregnancy. Abusing drugs during pregnancy can result in an increased risk of miscarriage, premature birth, mental retardation, sudden infant death, and low birth weight. Although many prescription drugs can be used safely during pregnancy, a woman should check with her doctor before taking ANY medications, even over-the-counter ones. Smoking during pregnancy can also lead to serious health problems, nearly doubling the risk of low birth weight and placental complications, and causing a much higher risk of ectopic pregnancy (where the fertilized egg implants outside the womb) and learning and behavioral disorders. Women should know about the risks of smoking or abusing drugs while pregnant, and stop all behaviors which can harm their unborn children. One of the best things a mother can do for herself and her unborn baby is to exercise regularly during pregnancy. Maintaining a consistent exercise routine helps to strengthen a woman's body so she can carry the extra weight she gains during her pregnancy. From Your Healthy Baby published by I am Your Child. I know there have been stories like mine and women who have been where I’ve been. I haven't met many birth mothers, but . . . we don't exactly wear a label on our shirts do we? I was the age of 19 when I found out I was pregnant. I remember I was scheduled to have my first college freshman final that morning, but instead I took a different kind of test. My knees hit the floor, I became numb and tears rolled down my cheeks from mixed emotions. My parents were shocked when I was finally able to share my news. It took a while to adjust to how my life was going to change. I was going to HAVE A BABY. A BABY! How could I have a baby when I felt like I was just a child myself?! I lost my faith for a while I won't deny that. Depression set in, I stopped eating like I should and I cried myself to sleep night after night. Then one night as I lay in bed I began to pray. I hadn't prayed in months, but I slept more soundly that night. My family and I prayed over an option that seemed so very unclear but right all at the same time. Adoption. I ultimately didn't go through an adoption agency. However, I did look at many different couples at some agencies, but I just couldn't find the right fit. My uncle knew of a couple trying to get pregnant but because of infertility problems they were unable to conceive. At the time as I was pouring over couples they were fostering 3 children. As they were preparing to adopt, the children’s biological family regained custody. This couple was crushed and heart broken. They decided to get away for a weekend to regroup and figure out what was to come next. As they prayed at church they asked God to open a door because they were so very ready to give up. The afternoon they were headed back home they received a phone call from my uncle telling them that I had a baby for them and that I wanted to meet them. The moment I met them it was like meeting long lost family. We clicked and I knew they were meant to be baby C's parents. When I decided to place my birth son, the last thing I did was give up. I chose adoption in the middle of my pregnancy because I knew he needed a mom AND a dad. He needed a good Christian home to grow up in. He needed so much more than I could ever give him. Don't get me wrong; I was terrified of this decision because I knew it meant living without my son. It meant placing him before myself. I knew that if I didn't make this decision, my life wouldn't be the same. I’m not saying that it would be terrible, but just different. I may not have met my sweet husband. I may not have the faith I have today, nor would I be able to write about being a birth mother. I wouldn't know the two most amazing people that I get to call my birth son's parents. Not making the decision to place would mean I couldn't spoil him like I get to by being his birth mother - that's my favorite part! The day I placed my birth son into the arms of his parents was the day I became a birth mom. The day I placed my birth son was the day his parents became a mommy and daddy. You share your title as mother with another woman along with a bond no one else understands. I knew that placing meant being in the presence of true love. Placing means taking an unplanned situation and turning it into a gift for everyone. I placed my birth son. That never meant he was unloved or unwanted. He was prayed for before he was born by so many people. Our amazing God turned a mess into a message. Before they left with him, his mom and I shared an embrace that is almost impossible to describe. It was a bonding of two women who became moms in very different ways and were joined together by a very BIG love, and tiny little boy. We will forever be linked in a unique and unforgettable way. I love her for the way she loves my birth son, and she loves me for the irreplaceable gift I gave her and her husband. To this day when she and I hug it is a hug built on love, trust and motherhood. It is a way of silently thanking each other and praising God for what He was done for us. During your first prenatal visit, the Doctor or Health Care Provider will collect lots of information. You will be asked about pregnancy symptoms and have blood tests. Questions about your past medical and family history will be requested. All sorts of information will be collected so later, if anything needs to be checked, we will have a reference point. A beginning point. Something to compare to, from beginning to end. Like weight, blood pressure, blood results. We are about to go on an amazing journey and we want all the information we can have. Your body is about to change in wonderful ways and a little person, me, will grow inside there. I say, let's be as prepared as possible! During this First Month, Ask Questions! I know you have a lot of questions. Ask your Doctor or Health Care Provider. They are there to help us. They enjoy being a part of this journey. Be sure to include them! Are you tired? Sleepy? Have food cravings? Upset one moment and happy the next? There are lots of changes going on in your body. You need someone to talk to and that is why you have a Doctor or Health Care Provider. They can give you answers to your questions and they can help make the journey more comfortable. You will become friends. Remember, we all will be spending 9 months together! Does Your Doctor Know . . . It is important to tell your Doctor or your Health Care Provider about your past medical history. Have you been pregnant before? Have you had a miscarriage? Special health problems? Be sure to share everything, no matter how major or minor you think it might be. Let the Doctor or Health Care Provider decide. We both want to get the best medical help. This can happen only if you are honest and open with the Doctor or Health Care Provider. Drinking any alcoholic beverages while I am developing can cause problems in how my body and brain will work after I am born. What you drink goes directly to me. And it affects me twice as much. We both want me to be healthy, so please be very careful about what you drink. Please do not take any drugs unless your Doctor or Health Provider has said it is OK. This includes prescription drugs and drugs that you can buy at the drug store without a prescription. It also means any drugs that someone else may give you. And it especially means no drugs such as marijuana or cocaine. Taking such drugs can cause damage to my little body or my brain. Before you put anything into your mouth or body, please think about me. It does make a difference! Anything you take that is unhealthy can have a long term result on me. That means I could be retarded or have birth defects. That is not something you can go back and fix later. The decision you make today can change me tomorrow. Please make sure your decisions are good...for both of us. Thank you! I don't think I like smoke very much. I know it is not good for me, so I am going to ask you to please not smoke while I am growing. Smoking can cause me to be born too early...before I have time to grow like I need to. It could hurt my little lungs and make it hard for me to breath. Smoke can keep me from gaining the weight I need to be healthy when it is time for me to be born. Help me to be healthy and strong. And please, do not let other people smoke around us. Second-hand smoke is not good either. Remember, whatever you eat and breathe, so do I! Drinks that have caffeine in them might not be the best thing for us right now. Caffeine may be in coffee, tea and many soft drinks. You can get drinks that are "caffeine free." Caffeine acts like a "diuretic" and draws fluid from the body. This means it also draws good things like calcium out of the body and we need calcium for both of us to be healthy. Caffeine also makes you feel "full" and makes you not as hungry. But because you are eating for two people, you need to eat good nutritious meals. It is better to drink lots of water, which is good for both of us. As I grow in your tummy, you need to be careful about things that have extreme heat. These include hot tubs, saunas, electric blankets and heating pads. As your temperature increases, it can become dangerous for me. If you increase your temperature by using hot water or heat, and it stays over 102 degrees for a while, it could hurt me. Please ask your Doctor or Health Care Provider about this. It is better for both of us to know in advance. Because I am growing inside of you, there are things you did before that might not be good to do while I am growing. I know it will be hard, but think about how wonderful it will be when I come out healthy and strong and you know that you helped to make me that way! Ask your Doctor or Health Care Provider for good "Dos" and "Don't" while you are expecting. Good foods and healthy exercise will help us both. I will thank you! There are many cleaning supplies that you can still use, even though you are expecting, but there are also some that might be dangerous. If the cleaner has a strong odor or fumes, check with your Doctor or Health Care Provider before you use it. Even if it is OK to use, try not to breathe in the fumes. Aerosol sprays cause more fumes. Try switching to pump sprays. Also remember to not mix different cleaning products. Together their fumes coud be very dangerous. Mommy Needs to Take Care of Herself Too! I know you were a busy person before I came along, but you might have to slow down for a little bit! Use good sense about everyday things. If you work and it means lots of heavy lifting, long hours or standing for a long time, maybe you should check with your Doctor or Health Care Provider. Working around loud noises or chemicals might also be a problem. While I am still growing, you might need to take it easy for a while. Again, it is better for us both to be healthy. It is always important to eat the right foods. Your body needs certain vitamins, minerals, and other nutrients in order to function properly. When you're pregnant, however, it is doubly important. You're not only eating for yourself, but also for your baby. As your little one grows inside you, you'll need to increase your consumption of certain foods while staying away from others. We'll provide suggestions below to help you create a diet that offers the ingredients you and your baby need for the road ahead. Some of what follows will likely be intuitive. A few tips, however, may surprise you. If the foods you currently eat are unhealthy, now is the time to eliminate them from your diet. Ice cream, cake, pizza, and other types of junk food provide plenty of calories, but little else of value. Instead, increase your intake of vegetables, fruits, and lean meats. These foods not only offer calories (which are important), but also protein, and key vitamins and minerals. Regarding calories, a lot of moms-to-be wonder whether they need to significantly increase their intake since they're eating for two. In reality, an extra 300 to 400 calories per day is sufficient. One last note: ask your obstetrician to look over your proposed diet. If it fails to provide something she considers essential, ask for suggestions. Even the best diet may lack in certain vitamins and minerals. Making matters worse, morning sickness, along with nausea and vomiting, can deprive your body of the important nutrients it needs. For these reasons, consider taking a few supplements. You'll need extra folic acid, iron, and calcium, especially as you progress into your second and third trimesters. If you're a vegetarian, speak with your obstetrician regarding additional supplements that may be needed in the absence of meat. Many moms-to-be worry that they're gaining too much weight during their pregnancy. So, they try to shed a few extra pounds by cutting back on important foods. This is dangerous. As mentioned earlier, both you and your baby need the vitamins and mineral found in a nutritious diet. Depriving yourself of important foods does much more harm than good. As your baby develops, you'll gain weight. This is not only normal, but it's an indication of a healthy pregnancy. During your pregnancy, avoid sushi, sashimi, and other types of fish prepared and served raw. Also, avoid seared fish since they are typically served without having been thoroughly cooked. Oysters, scallops, and other shellfish should likewise be shunned since they, too, are usually served partially cooked. This type of seafood contains bacteria that could prove harmful to your baby. Many fish are served fully cooked, but should still be avoided due to high levels of methylmercury, which can be unsafe for your baby. These fish include swordfish and shark (among others). Eating three meals a day may become a chore if you deal with persistent morning sickness or heartburn. There will be times when you're not the slightest bit hungry, but know your baby needs food. You'll be tempted to skip meals, or cut back on the volume you're eating. A better solution is to eat smaller, but more frequent, meals. Rather than three large meals, eat smaller portions five or six times throughout the day. Not only will your body will be able to digest the food more easily, but eating reduced portions will feel more comfortable. The foods you eat during your pregnancy are just as important as those you avoid. When creating your diet, consult your obstetrician to ensure you and your baby receive the vitamins, minerals, and nutrients you need.